Mr. Toppit comes from the Darkwood, not for me, not for you, but for all of us. This is the only snippet of information any of us are given before Arthur Hayman is tragically killed in a car accident, ending the Hayseed Chronicles, an obscure British series of children's books, before they are complete. Arthur's dying moments, however, are spent with an American tourist who will unwittingly launch the books into world fame, turning them into an international phenomenon. With Arthur gone, the legacy of the books falls to Arthur's strange and flighty widow, Martha, and their children, Rachel and Luke - Luke being eternally preserved in the pages of the Hayseed Chronicles as Luke Hayseed. First-time author Charles Elton tackles the issues of family and fame through the lens of the at-first obscure and now-renowned book series, at times funny and at other times heartbreaking. Each of the characters around which the story is centered deals with the death of Arthur and the subsequent rise of the books in their own ways: Martha descends into her own strange world of living, Rachel descends into a world of drugs, and Luke into a boxed-off, withdrawn world of himself. Laurie Clow, the American tourist, moves onto national television, and Lila, the unwelcome artist of the series, into the role of unofficial Hayseed historian. Elton's sense of character and personality is astounding, and he captures each important detail on the page, albeit subtly. Though his characters act and interact as though aliens in a foreign land, each of their movements, thoughts, motivations, is carefully constructed and not entirely unexpected. Elton's writing style is charmingly British, well-executed and all-around pleasing to both the eye and ear. Bottom line: At times laugh-out-loud funny and other times truly heartbreaking, Mr. Toppit captures the power of books on its pages, from the Hayseed phenomenon driving fans to near-madness to the fame of the books driving its family into a steep and unsteady rise and decline. 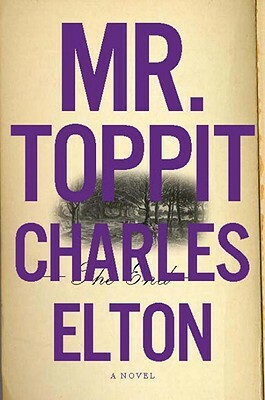 Personally, I'm excited to see more from Charles Elton, and can only hope his sophomore novel comes soon - and lives up to expectations. *It's also the question printed on my new purple Mr. Toppit umbrella, picked up from the Other Press booth at BEA this year. Note: I received a (signed!) galley of this book from Other Press at BEA this year. They were in the booth next to mine, so I even got to stare at the book for some time before actually going over to get a copy.